As the hometown of tea, China owns a profound, continuous and time-honoured culture of tea. It is blended with the ideas of Confucianism, Taoism, and Buddhism. It especially presents the Confucian ideas of being clear, optimistic, warmhearted, kind and tolerate. And on the land of historical Sichuan, it bears a unique branch of Chinese tea culture – the Sichuan tea culture. 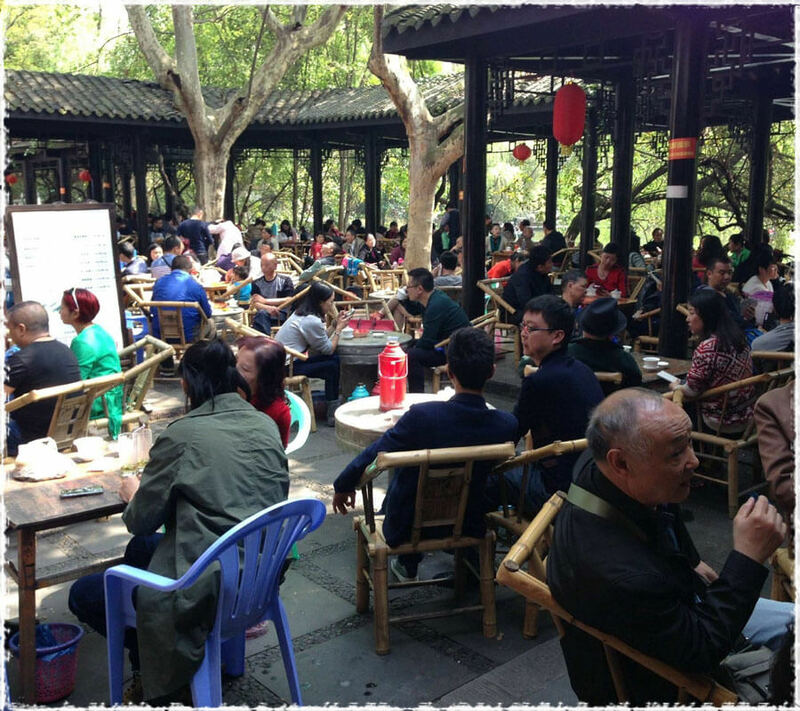 Chengdu people love tea houses, because they love 摆龙门阵 (bǎi lóng mén zhèn, means chatting, gossiping). They will gather together in a crowded tea house, drink tea when chatting. At leisure time, have a cup of tea and pastries, watch actors performing traditional arts, talk and laugh with people in the tea house, these could be true joy of life. 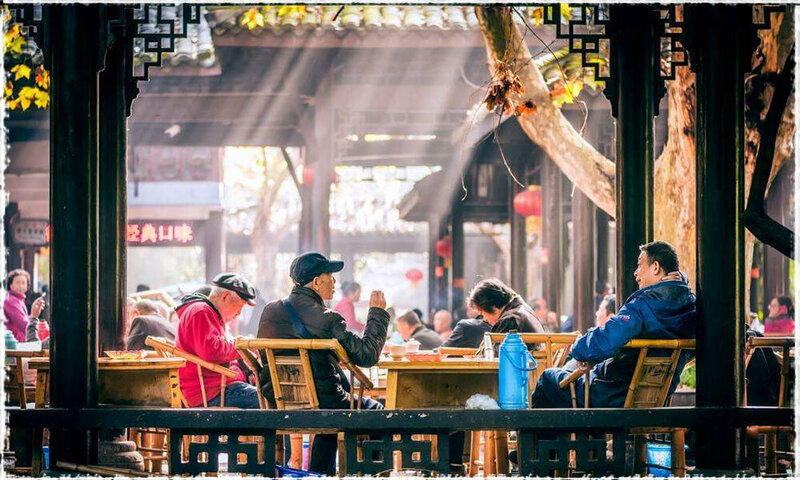 Except for relaxing, Chengdu tea houses are also important social places. In old society, people from different fields and communities gathered in tea houses for business negotiation or trading. Even local gangdoms traded firearms and opium there. Pao Ge (袍哥会, a civil group in Sichuan) set their Matou (码头, a meeting for the group and other people) in tea house. Often, tea houses also have restaurant and hotels. During school holidays, it became a place for searching teachers. We can say that all sorts of occupations regards tea house as a good place for meetings. Thus Chengdu tea house was a mirror of the social life in the city. Back in the old China, tea house also had a function as civil court, mediating disputes in the neighbors. When disputes happen, both sides will agree to discuss in a tea house. They will invite a bigwig attending the discussion as mediator. The mediator will judge which side is right after they finish discussing. Like the saying in Sichuan 一张桌子四只脚，说得脱来走得脱 (means that you can leave if you have reasonable ground), if both sides are responsible, they need to go fifty-fifty on the tea. Otherwise, the side who is responsible for mistakes must pay for the tea, and admit defeat. Tea house is also a place for recreation. In the evening, there will be amateurs performing Sichuan opera in the tea house, known as 打围鼓. Besides, some tea houses have performance of Chinese dulcimer, storytelling, QingYin art and others. People in the tea house can enjoy the traditional Sichuan folk arts while drinking teas. Except for selling teas, tea house has candies, cigarette, and other foods like peanuts. After the new China’s establishment, new entertainments were introduced, including Mahjong, Chinese chess, books and newspapers, flowers, pet birds, even Karaoke and videos. The things they can play became more fashionable and modern. 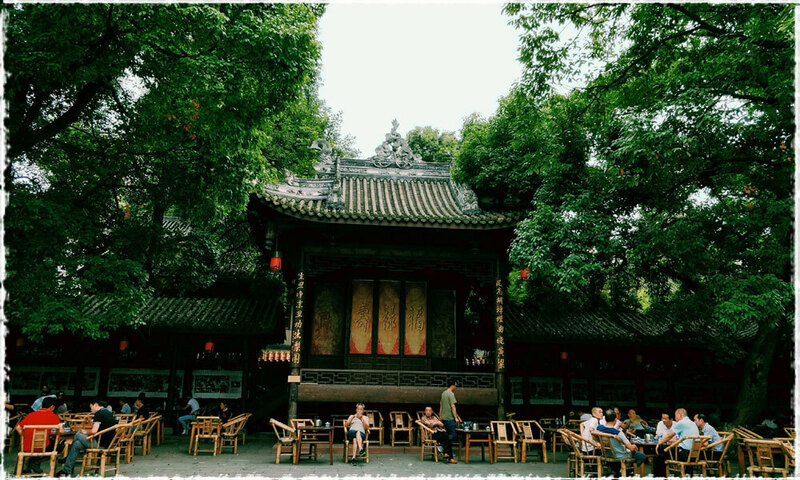 Yet as a traditional social space, Chengdu tea houses are still as usual. 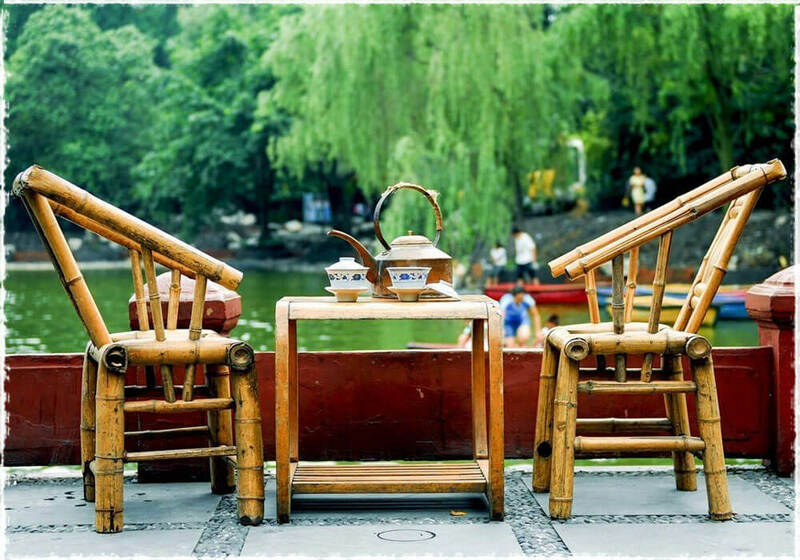 Constructed with bamboos, Chengdu tea houses are often decorated with bamboo desks and bamboo chairs. Tea’s fragrance floats in the soft wind. The teas they using are usually jasmine green teas, Dragon Well, and Bi Luo Chun. They use northern Gaiwan as tea wares (larger than Gongfu Gaiwan). Gaiwan is made up of three parts: the lid, the cup and the saucer. Each has unique function. The saucer supports the cup for holding by hands, also can protect the desk from high temperature. The lid can keep the heat in the cup, and can also block the floating leaves, making it more convenient for drinking. Its exquisite appearance and ingenious function make the Gaiwan a work of art. The performance of the tea service master in Chengdu tea house is also a scenery. When they pour water into the Gaiwan, you will see the water spout falling from the air into the Gaiwan, with a lively sound; in an instant, water stops. Then look at the Gaiwan. The water in it is just right at the level of the Gaiwan’s mouth, with a single drip on the desk. This is a unique skill, as well as a artistic satisfaction. Chengdu tea house is prosperous since existing. No matter where you are, in a scenic area, or in a busy street, you can see those featured tea houses. They have reasonable price, good service. People can stay there for half a day, having only a cup of tea and little snacks. In the talks of friends and neighbors, the colorful tea culture of Sichuan is fully expressed. Hope you enjoy your trip and have an unforgettable journey next Spring. The tea gardens are always very beautiful at Spring. Wow…I am new to tea drinking and this site is a wealth of knowledge. I am very impressed with both culture and tea processing. NextNext post:Shifeng Mountain – the Cradle of Famous Longjing Tea.